It includes 26 short stories (several of which have been featured on the Title 18: Word Crimes podcast) and six true-crime essays. The stories collected here have been published by places like Thuglit, Needle, Otto Penzler’s Kwik Krimes, Akashic Books’ Mondays Are Murder, and Mary Higgins Clark Mystery Magazine. There are also seven brand new stories. 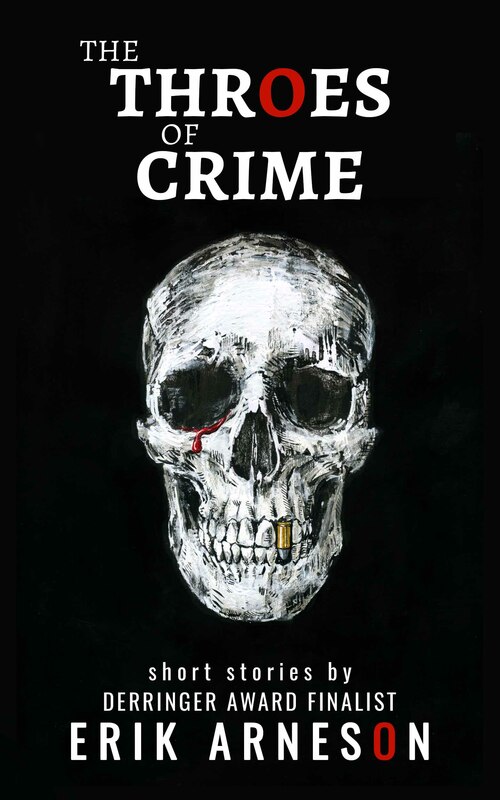 All proceeds from THE THROES OF CRIME benefit the James & Jeanne Arneson Memorial Scholarship Fund, which provides financial support to graduates of Wilmot High School in Wilmot, South Dakota, who display an aptitude in creative writing by authoring a short story. The goal of the scholarship is to encourage students from Wilmot to continue writing fiction well beyond high school, to tell the stories that only they can tell. Powerful stories and funny stories and magical stories – stories the world is waiting for, even if it doesn’t realize it just yet.